Hoe hoe grow: Side order of Begonia with that, madam? On arrival at Thompson & Morgan's 'Online Media Press Day', we were all immediately encouraged to taste begonia petals, fresh from the plant ... not what I was expecting at all! The taste, should you be wondering, was fresh, citrusy and surprisingly good. 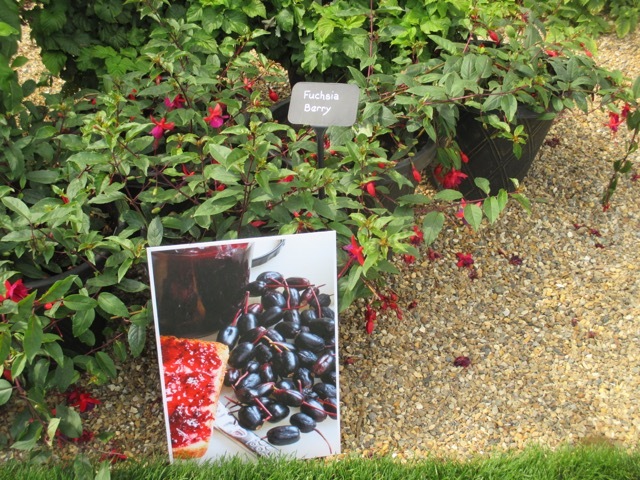 The edible theme continued as we were shown a new fuchsia, 'Berry', which, you guessed it, has been developed for its large and tasty berries. There is no stone or pip, so you can just pop the whole thing straight in there, as you wander round the garden. Being the sort of gardener who feels peckish as soon as they leave the kitchen, the thought of constant floriferous snacks is quite appealing. 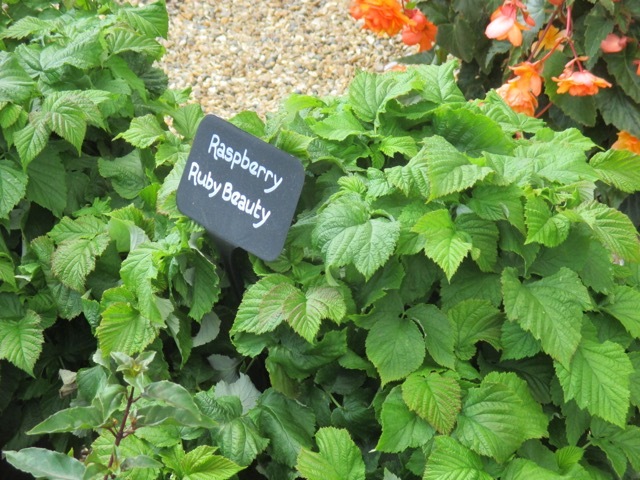 Throw the dwarf patio raspberry 'Ruby Beauty' into the mix, and you have your own picnic before you've even left the patio. 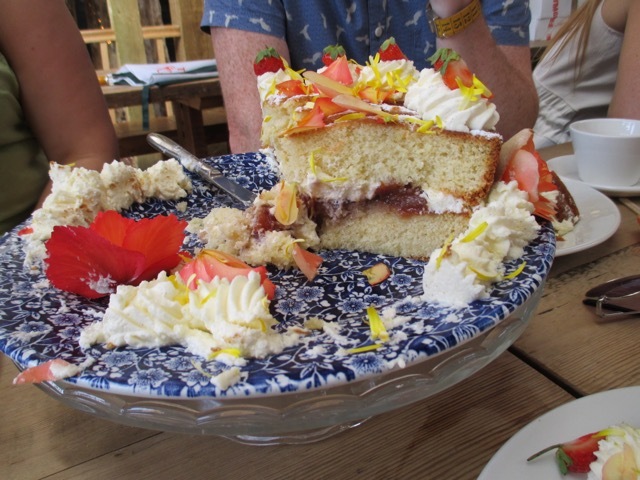 Even the cake served to us at afternoon tea was decorated with edible petals - and short work was made of that too! Having whet our appetites with edible flowers, the foody theme continued with a talk about new T & M veg varieties, including a tasting of 'Wasabi Rocket' - a hot peppery leaf with that distinctive Wasabi flavour. We were all given a packet of seeds to try, and, having been assured that it is not too late to sow, I am keen to sow some immediately. They are a successional, 'cut and come again' crop which can be harvested in just a few weeks. The new T & M 'Trial Garden' is situated on 'Jimmy's Farm' (just South of Ipswich) for the first time this year, to encourage visitors to look around and see what is available, and how it performs in a garden environment. New additions to the catalogue are featured, and there are also some new plants being trialled there, which are not yet available in the catalogue. ... and 'Green with Envy'. Not really my thing, but great fun, I guess, if it is your thing ! 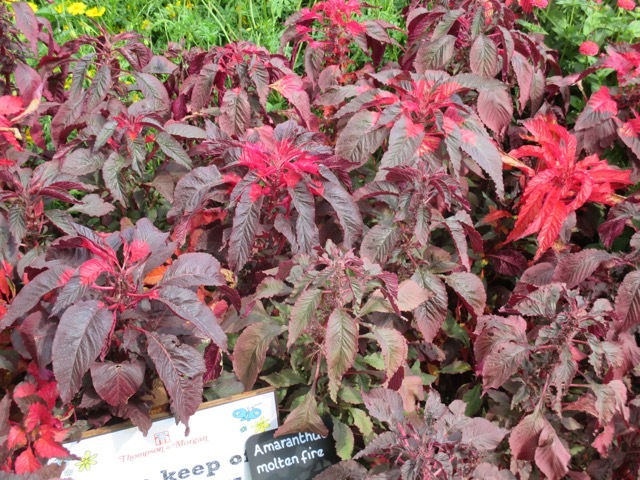 More my thing was a lovely Amaranthus called 'Molten Fire', which doesn't have the long tassels usually associated with 'Love Lies Bleeding', but instead has explosions of bright pink at it's core, which increase in size as the season progresses. These would look good in a hot, sub tropical border with Ricinus, dahlias, cannas etc, and I will be giving these a whirl next year. Another of my favourites was a Rudbeckia mix called 'Caramel', which contains the lovely 'Cherry Brandy' amongst others. 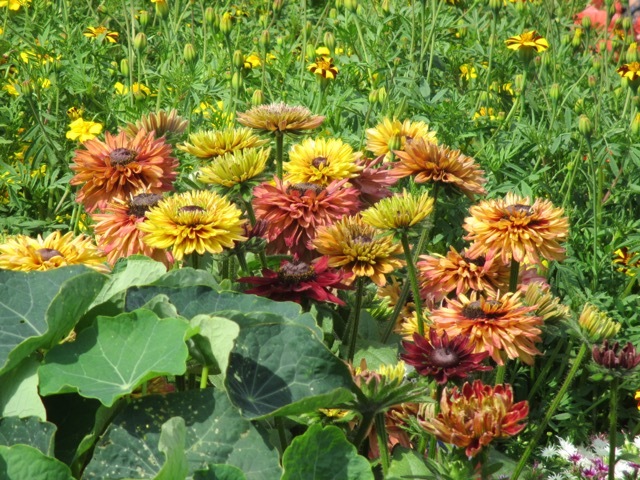 The mix has been developed to flower from early July, which is much earlier than most Rudbeckia. The colour mix is a very subtle one, with soft yellows, russet tones and dark reds. Although I haven't personally had much luck at germinating Rudbeckia so far, I will be trying this one next year. What's not to love about Cosmos? Elegant foliage, prolific flowers until the first frosts, a good cut flower ... 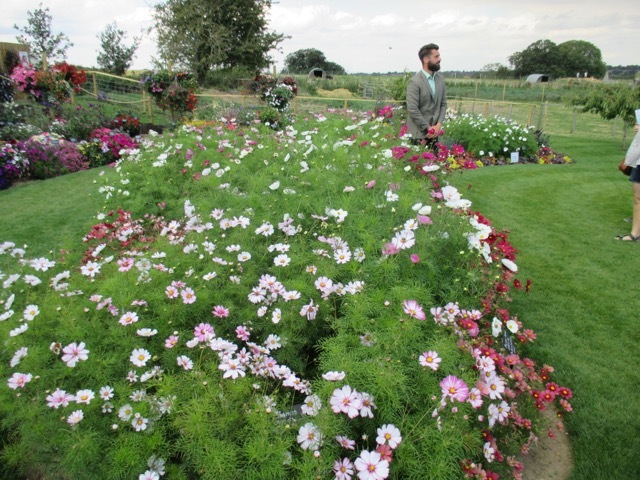 The T & M Trial garden showcased several different varieties to demonstrate the versatility of Cosmos, for both size and colour. 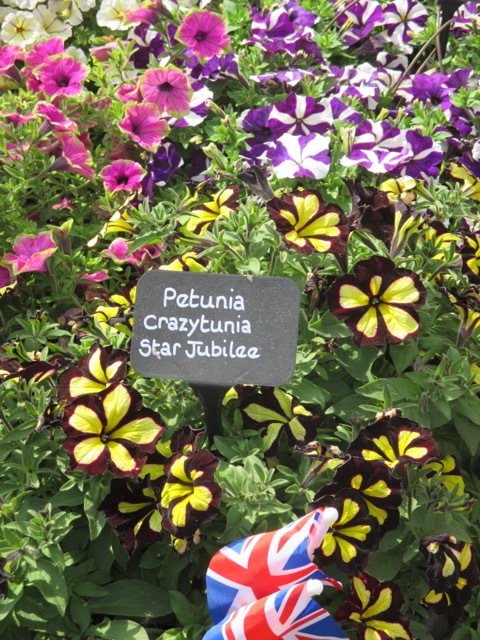 There was an interesting variety called 'Cupcake' which has frilled, more robust looking petals, and this is apparently very suitable for growing in tubs. One more to add to my list. We were also shown the first yellow Cosmos 'Xanthos', an attractive pale lemon, with darker centre. 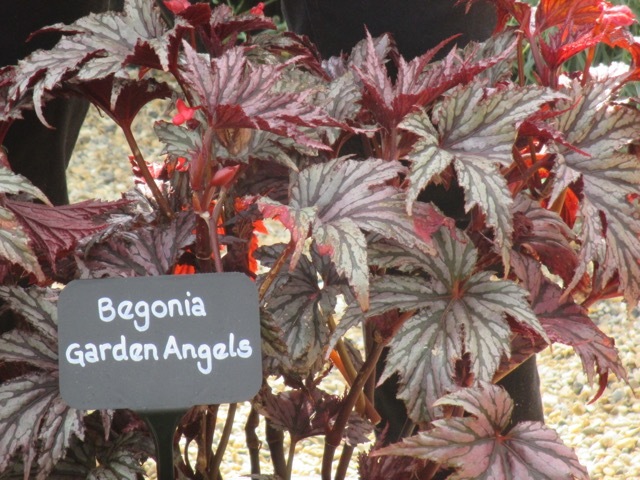 One for the sub tropical garden is Begonia 'Garden Angel', which resembles one of its parents, the tender 'Begonia Rex'. However, this new cross is hardy down to minus ten degrees, we were told. It could be a fantastic addition to the sub tropical border. 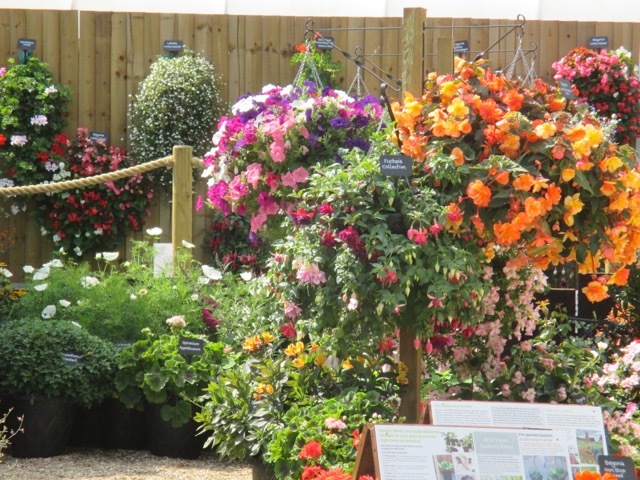 All these gorgeous plants and glorious sunshine all afternoon too! Many thanks to Michael, Kris, Terri and everyone else who made it so enjoyable. Tastier than you might think! I know what you mean about eating flowers ! It just seems like a waste of something lovely! The 'Garden Angels' will be fantastic I think, just hoping they are hardy enough to cope without as well as cold ! They have some wonderful plant markers! Regarding the tastings--wow, I would never think to eat Begonias. I first learned that Fuchsia berries were edible last year, from Helene at Graphicality-UK. Fuchsia berries are so tasty! Looks like you had a great time! You sound as if you are speaking from personal experience about the fuchsia berries ! You can make jam with them too, we were told, and no skinning , peeling or stoning to do! So many new plants there to look forward to, more to add to the wish list for next year, I need a bigger garden! I know , Brian! I love trying new plants but often wonder how many will stand the test of time and still be growing well in gardens in ten years time, when all the novelty is long forgotten. The cake looks amazing, I think food with a floral decoration looks fabulous but I'm always a bit dubious when it comes to eating flowers. We visited Jimmy's Farm a few years ago, I wish the trial gardens had been there then. Hi Jo, this is the first year for the T & M Trial Garden , last year we were in a secret location, and would have to be killed if we divulged it!! Sounds like you had a great day. I'd be like a child in a sweet shop on such a visit. I'd struggle to contain myself I'm sure. My sister in law eats her Fuchsia berries after me telling her they were edible courtesy of Helene at Graphicality UK too. I've not tried them yet. 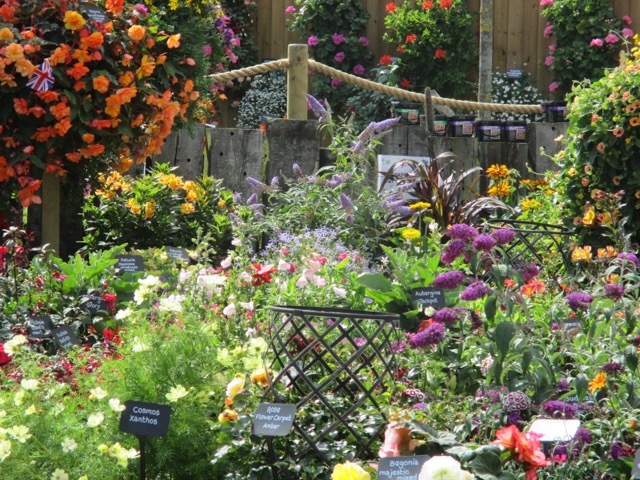 You've chose some lovely plants to try next year - wishing them will in your garden Jane. Hi Angie,you would have loved it. T & M gave us all a goodie bag containing, amongst other things, a packet of seeds of all their new varieties, so can't wait to get started ! 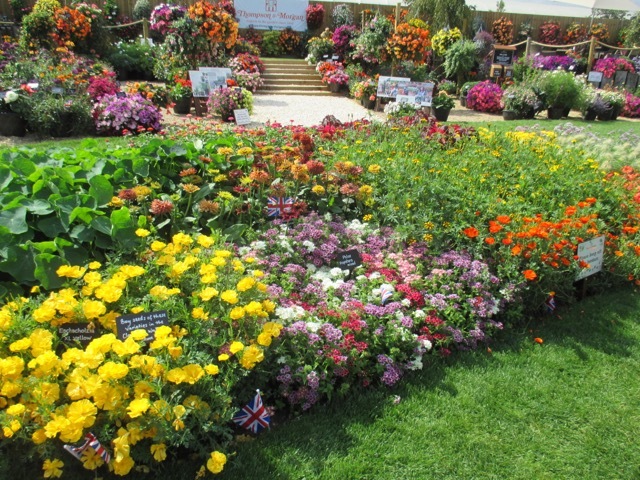 I must get hold of a catalogue for next year, there are so many interesting new varieties. I love the Rudbeckia too. What a great day you had. You were so close to where I live, only about half an hour away,. What a pity you didn' t get a chance to pop in. It would have been lovely to meet you. Perhaps next time? I didn't realise that I was so near to you, Chloris ! 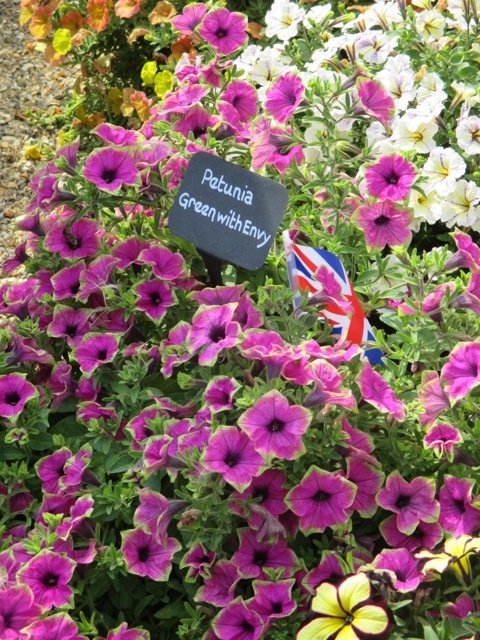 It would have been lovely to meet up - I would love to see your beautiful garden in reality rather than just virtually! This is somewhere to put on my list when I come to visit my MIL, it always makes such a difference to actually see something growing even though I'm sure their plants are lavished with masses of care so that everything looks its best all the time. I do like the idea of of the wasabi rocket - definitely something to look out for; I'm assuming there is a shop so you can full-fill the desire to buy immediately. The Wasabi Rocket is certainly a better bet than growing Wasabi itself! 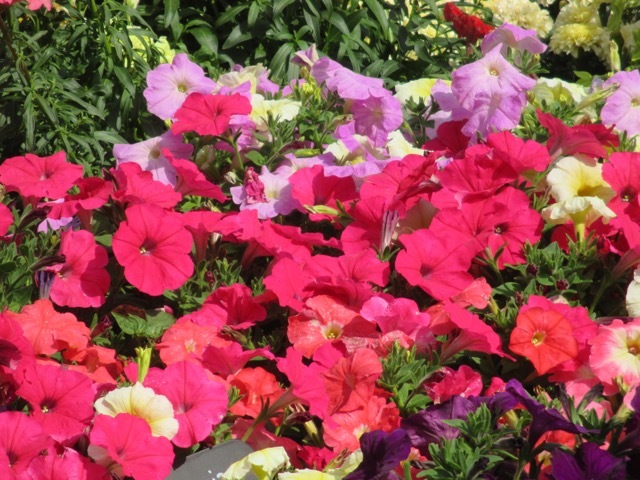 It can be cropped in just a few weeks, and successional sowing ensures a constant supply. Sadly no shop! Not that I saw anyway. The garden was described as a 'living catalogue' which I guess is an accurate description, and, yes, I guess all the plants are lavished with care and attention so that they look their best. To be fair , some of the 'experimental' plants, which were still on trial, were left even if they looked less than perfect. I bet you were like a kid in a sweet shop. Not sure about the splashed petunia it just looks rain damaged to me. That just about describes it ! You would have been interested in the veg talk, Sue, as all new varieties were discussed. I am going to try a pea called 'Terrain' which sounded good in many ways. Thankyou! Good to see you but we definitely needed more time to chat! 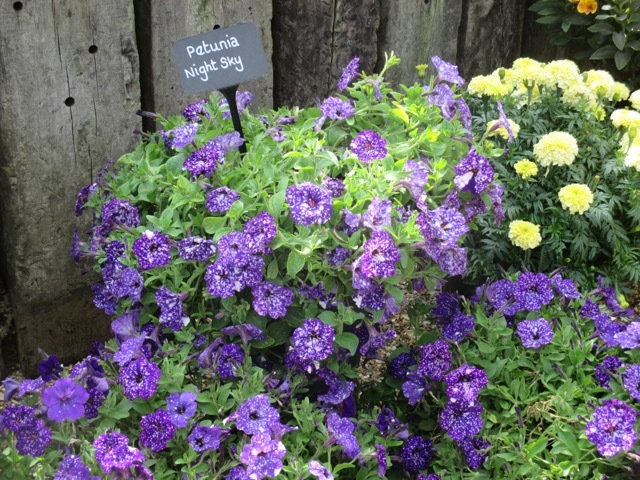 Interesting about Crazytunia, as there will always be huge fluctuations in temperature during one of our summers. Really love the idea of Wasabi Rocket - sure I can manage to wait the few weeks until it is ready to eat! Let's hope the slugs aren't tempted ! 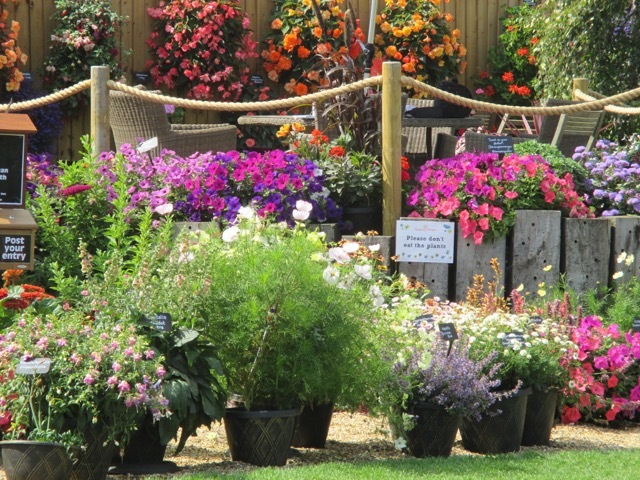 Bedding plant heaven, that. I do enjoy begonias, but I never thought about tasteing one. Absolutely ! I have yet to a appreciate the charms of begonias so eating them is fine by me! Ha ha ! I'm sure full risk assessments had been completed as not all Begonias are edible - don't know what happens if you try to eat the non-edible ones! This is the first time I heard of edible begonias..never thought about it..sound funny!.. Hi Normala, to be honest, I think I prefer my begonias in the garden rather than in the mouth! Really?! I've inherited a huge pot of begonias. You mean I can EAT the evidence? just checked the TM site. Only tuberous begonia, and not for people with rheumatism because of the oxalic acid. Sigh, my monster plant is NOT to eat. I am definitely a begonia broad. If I had a greenhouse I would grow them by the hundreds. I am fascinated by their foliage and of course the blooms are a bonus. I could see that big amaranth in your garden with the pink tops shining.